Discovered in 1901, Spindletop created the modern U.S. petroleum industry, changed the future of American transportation – and brought many new oilfield technologies. A newspaper’s questionable geology attempts to describe the new Texas oilfield. Beaumont was just another Texas Gulf Coast town until 1901 when a nearby hill known to locals as “Spindletop” changed U.S. petroleum history – and inspired birth of Beaumont Confederated Oil & Pipe Line Company. Far from previous production, a wildcat well erupted oil in on January 10 that would produce more oil than anyone ever imagined. The “Lucas Gusher” spawned future petroleum giants, including Gulf Oil, The Texas Company (Texaco) and Humble Oil (Exxon). Spindletop Hill would produce more oil in one day than the rest of the world combined. In its first year alone, the oilfield produced 3.59 million barrels of oil. Instead of a chisel bit and standard cable-tool rig, the 1901 Spindletop discovery well used an innovative new technology – the rotary drill with a “fishtail” bit. Beaumont Confederated Oil & Pipe Line Company was one of myriad companies quickly formed to capitalize on this oil bonanza. 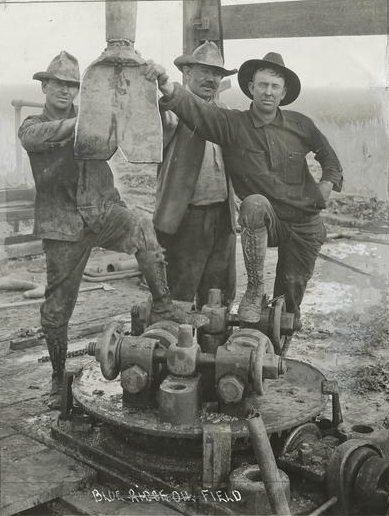 Learn more about the historic discovery in Spindletop launches Modern Petroleum Industry. Within four months of the discovery well, Beaumont Confederated Oil & Pipe Line Company (previously the Street and Alley Oil Company) incorporated in Austin on April 27, 1901. Capitalized at $2 million, the company issued stock and drilled four wells on Spindletop within walking distance of the 100,000 barrel-a-day gusher drilled by Capt. Anthony Lucas, a Croatian mining engineer and former officer in the Austrian navy. The November 3, 1901, Houston Daily Post included an illustration showing Beaumont Confederated Oil’s drilling and producing wells squeezed between other Beaumont leases. Company stock sold for 15 cents to 22 cents a share on the Houston Oil and Stock Exchange. 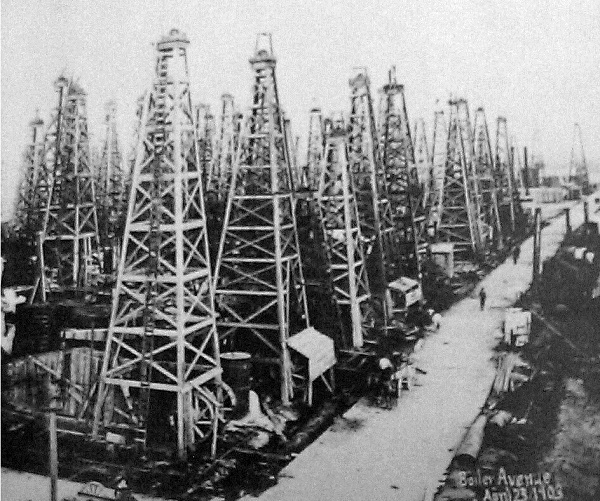 “Boiler Avenue, April 23, 1903.” Although the Spindletop field will produce more oil in one day than the rest of the world’s oilfields combined, excessive production will result in a collapse in oil prices. However, with Spindletop’s extraordinary production, the price of oil began to plummet, cutting margins drastically and jeopardizing many small operators. A newspaper illustration shows Beaumont Confederated Oil leases (in yellow) squeezed between others in the booming Texas oil town. For awhile, oil supplies overwhelmed demand. At the time of the discovery, John D. Rockefeller’s Standard Oil Company completely dominated America’s petroleum industry. Standard Oil had become a vertically integrated empire that included refining, production, transportation, and distribution of oil products. By purchasing property through subsidiaries, co-opting competitors, and local price-cutting, Standard Oil had become a near-monopoly. Growing anti-trust sentiment from independent oil operators in Pennsylvania pushed back against Rockefeller. Soon there were judicial efforts to limit Standard Oil’s proxies in Texas and other states. Texas newspapers noted that the J. M. Guffey Petroleum Company was part of Rockefeller’s empire. “It has been an open secret that the Guffey company, which began business in the state about the time the Standard was run out two years ago, is simply another alias for Standard in this state,” noted one reporter. In 1904, a Travis County attorney named the Beaumont Confederated Oil & Pipe Line Company in two separate suits alleging the company as party to Standard Oil Trust “hidden operations” in Texas through the J. M. Guffey Petroleum Company. The state sought forfeiture of Beaumont Confederated Oil & Pipe Line’s charter to do business and penalties of more than $3 million. Ultimately, Beaumont Confederated Oil & Pipe Line Company lost its charter to do business in Texas on May 6, 1904. It disappears from records thereafter. J. M. Guffey Petroleum paid its fines and continued to prosper. It became Gulf Oil Corporation in 1907 when James Guffey sold his interests to his partners for $3 million. The 1901 Texas discovery “changed the way people would live all over the world,” Houston wildcatter and historian Michel T. Halbouty proclaimed in his 1972 book, The Last Boom: The Exciting Saga of the Discovery of the Greatest Oil Field in America. The stories of exploration and production companies joining petroleum booms (and avoiding busts) can be found updated in Is my Old Oil Stock worth Anything? The American Oil & Gas Historical Society preserves U.S. petroleum history. Please support this AOGHS.ORG energy education website. For membership information, contact bawells@aoghs.org. © 2018 Bruce A. Wells.